off following their G.D.O.D. (Get Dough Or Die) 2 mixtape, just released a few weeks ago. 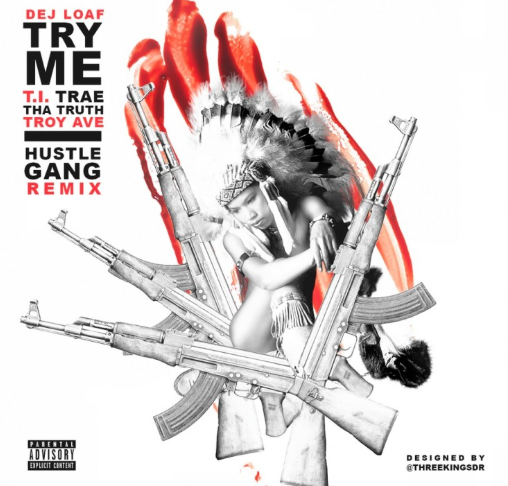 The ATL-based collective decides to add their two cents to the current popular “Try Me” single from Detroit rapper Dej Loaf. After showing support for the KANG’s album release party on Monday night, the Hustle Gang offers up their updated version to the DDS-produced single with Trae That Truth and Troy Ave joining T.I.P. for the latest remix. With T.I.’s new Paperwork album out now flooding the streets, it doesn’t feel like his Hustle Gang imprint is taking anytime off following their G.D.O.D. (Get Dough Or Die) 2 mixtape, just released a few weeks ago. The ATL-based collective decides to add their two cents to the current popular “Try Me” single from Detroit rapper Dej Loaf. After showing support for the KANG’s album release party on Monday night, the Hustle Gang offers up their updated version to the DDS-produced single withTrae That Truth and Troy Ave joining T.I.P. for the latest remix.